We have all heard of omega 3 and omega 6 fatty acids. But do you know the difference between each one or how they work? Here is information to guide you in eating a healthy diet with the right balance of omega fatty acids in your meals. Omega 3 Fatty acids: What are they? Omega-3 fatty acids are polyunsaturated fatty acids that are essential nutrients for health. We need to obtain them from our diets because they are not manufactured by the body. Omega-3 fatty acids are needed for numerous normal body functions, such as controlling blood clotting and building cell membranes in the brain. Omega-3 fatty acids also have been associated with many health benefits, including protection against heart disease and possibly stroke. Other studies are showing potential benefits for a wide range of conditions including cancer, inflammatory bowel disease, and other autoimmune diseases such as lupus and rheumatoid arthritis. There are two major types of omega-3 fatty acids in our diets: One type is alpha-linolenic acid (ALA), which is found in some vegetable oils, such as soybean, rapeseed (canola), and flaxseed, and in walnuts. ALA is also found in some green vegetables, such as Brussels sprouts, kale, spinach, and salad greens. The other types, eicosapentaenoic acid (EPA) and docosahexaenoic acid (DHA), are found in fatty fish. Examples include cod liver, herring, mackerel, salmon and sardines. Most Americans do not eat enough of omega 3 fatty acids in their diets. It is recommended for good health to aim to get at least one rich source of omega-3 fatty acids in your diet every day. Either by eating a serving of fatty fish, or using a tablespoon of canola or vegetable oil in salad dressing or in cooking. 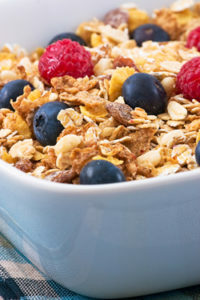 Try snacking on a handful of walnuts or adding ground flaxseed to your breakfast oatmeal. Omega-6 fatty acids are also polyunsaturated fatty acids that are essential nutrients, meaning that our bodies cannot make them and we must obtain them from food. They are abundant in our diets. Omega-6 mostly comes as linoleic acid from plant oils such as corn oil, soybean oil, and sunflower oil, as well as from nuts and seeds. They are also found in meat, poultry, and eggs. The American Heart Association recommends that at least 5% to 10% of food calories come from omega-6 fatty acids. Omega-6 fatty acids have been found to lower LDL cholesterol (the “bad” cholesterol) and reduce inflammation, and they are protective against heart disease. You can see both omega-6 and omega-3 fatty acids are healthy for the body. Vegetables, especially green leafy ones, are rich in ALA, one form of omega-3 fatty acids. Although ALA isn’t as powerful as the other omega-3 fatty acids, DHA and EPA, these vegetables offer a bunch of benefits, from fiber to antioxidants, in addition to omega-3.